The Northern Shrike continues on Disposal Road in North Arlington and Lyndhurst. It is being seen perched on bare branches on both sides of Disposal Road. As of 1 p.m., it was hunting the Kingsland Landfill closer to Harrier Meadow and the PSE&G substation, and was perched on a small tree near the top of the landfill. A spotting scope is a good idea. It was not as close as it was earlier this week. This is the sixth day in a row it has been seen in the area. We think it's a he because we have heard it (him) singing. To get to Disposal Road, to follow the directions to DeKorte Park on the left-hand side of this blog, and bear right through the "Authorized Personnel Only" sign and proceed a half a mile or so… Parking on left, past the Carillon near the Erie landfill. Also seen — Coopers' Hawk, harriers, Belted Kingfisher, Red-tails, male Kestrel. Scroll down for more shrike posts, including a pic of the shrike coughing up a pellet. This Sunday (Dec. 20), the New Jersey Meadowlands Commission will participate in the 110th annual Christmas Bird Count, and you can help — without leaving home. This nationwide bird census invites people with backyard feeders to tally the birds they see and submit the results as well. All you have to do to participate in the local count is to register with me, pay a $5 fee (which goes to the National Audubon Society to help defray the CBC's administrative and tabulation costs), and then keep watch of the birds visiting your feeder on Sunday. 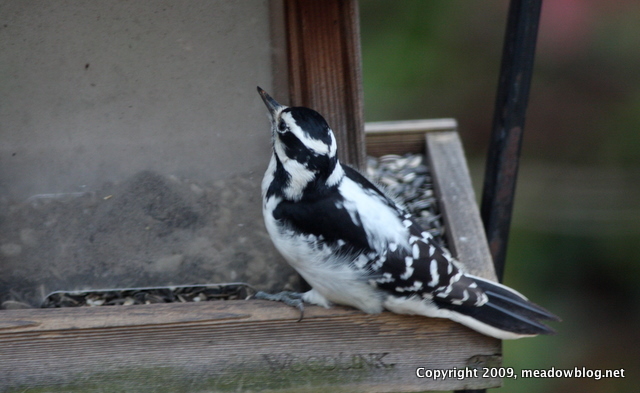 Click "Continue reading …" to see how Meadowlands residents can count birds at their feeders on Sunday.